Women's hockey took a step forward and a step back in the span of a day this week. Over 100 players in and outside the United States national team pool exercised collective power to wring financial concessions out of USA Hockey. Women's hockey took a step forward and a step back in the span of a day this week. Over 100 players in and outside the United States national team pool exercised collective power to wring financial concessions out of USA Hockey. They used participation in the women's world championship in Plymouth, Mich., as their hammer. "Certainly a historic day in women's sport on Tuesday night," U.S. captain Meghan Duggan said. "I can only hope women continue to stand up and fight for things and move the needle in that aspect." Less than 24 hours later, the University of North Dakota swung the axe on its Division 1 women's hockey team along with the men's and women's swim teams due to budget constraints. Seven Canadians, including national team defenceman Halli Krzyzaniak, played for UND this season. Eight current and former Fighting Hawks are representing four countries at the world championship that opened Friday at USA Hockey Arena. Krzyzaniak, a senior, called the elimination of her team of the last four years "a disgrace." "For the Americans, that was a huge step forward for them as a country, but then coming back to the UND decision, I just feel like that's so disappointing," the 22-year-old from Neepawa, Man., said. "With only 35 Division 1 programs and to cut one of them when hockey was still growing, I think that's just unacceptable. They need to invest more in it." The NCAA and Canadian university hockey are feeders into the Canadian Women's Hockey League and the National Women's Hockey League. Those are also the places where many women take their game to the next level after minor hockey, and are the jumping off points to their respective national teams. The CWHL isn't yet paying players a salary. The NWHL cut salaries in half to a maximum of $13,000 US in its second season this winter to make payroll. The battle continues in women's hockey on how to generate the money to create a product that sustains players as paid professionals. On the international front, the International Ice Hockey Federation committed in 2010 to spend $2.1 million CDN promoting and developing women's hockey for the next four years. But the women have arrived at a world championship that pays zero prize money in comparison to the hundreds of thousands in the prize purse at the men's world championship. The prize money is split on an escalating scale between the top eight teams in the men's tournament. When Canada won the men's world title in 2015, they received an additional bonus of one million Swiss francs ($1.3 million CDN) from a sponsor for going undefeated though that tournament. Melody Davidson, Hockey Canada's general manager of national women's team programs, also sits on the IIHF's women's committee. She says prize money was a recent topic of discussion at the committee level. "We started talking about what does the prize money look like across the board and what is the support given to the wide variety of programs," Davidson said. "We did start to have those discussions in December. "Definitely there's a disparity there, but you have to start talking about it first before you can make a change." Caroline Ouellette played in 12 world championships for Canada and returns to her 13th as an assistant coach. Prize money is another battle the women will have to take on, she said. "As athletes that commit ourselves to our sport to the same level as the male athletes, we would think it would be fair that the organization, the IIHF, would find it would be the right thing to do to offer the same equal prize money to athletes that win the world championship," Ouellette said. "I think we still have to fight for that and make our point and raise the visibility for our sport and the popularity." 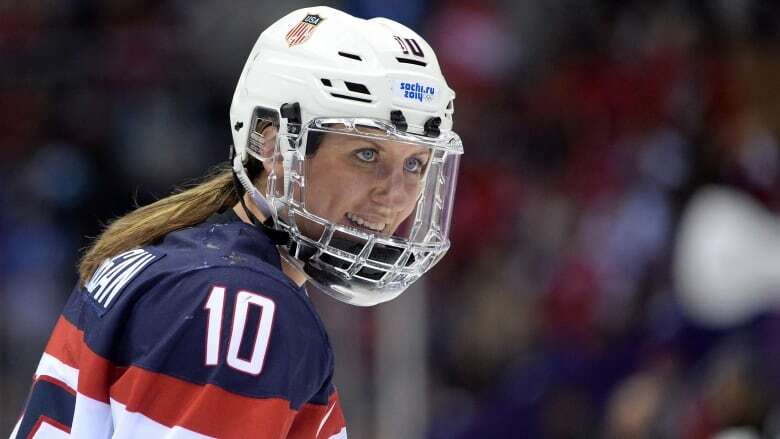 The Canadian and U.S. federations are still "significantly" ahead of other countries in financial support of their female hockey players, according to Davidson. Finland goaltender Noora Raty said she would have retired after the 2014 Winter Olympics had she not got a contract with a third-division men's pro team. The contract provides her with an apartment and a modest income for a six-month season. She coaches the rest of the year to earn money. "Ninety per cent of our team works full time and plays on the side and train as much as I do," Raty said. "If we ever want to catch the U.S. or Canada, we should be full-time players. We're definitely giving them an advantage because they play and train full time. That's the difference."